Since it's founding in 1934, Portugal's Primeira Liga has been absolutely dominated by three clubs: Benfica, Porto and Sporting CP. In 82 seasons of league play these teams have accounted for 80 league titles with Benfica scooping up 35 championships, Porto winning it 27 times, and Sporting CP finishing on top 18 times. Even leagues such as the top flight's of Scotland and Spain, which have been dominated by a couple of clubs themselves, have never seen such historical dominance by their country's biggest sides. While club's like Aberdeen in Scotland or Atletico Madrid in Spain have popped up over the years to win titles in their respective leagues, no club has come close to challenging the supremacy of Benfica, Porto and Sporting CP in Portugal over a sustained period. Lisbon side Belenenses captured the first title not won by one of "Os Três Grandes" (The Big Three) in 1945-1946, but for more than half a century they stood as an anomaly in the Portuguese footballing record books. Fifteen years ago this week though, the city of Porto's 'second' club, Boavista F.C. who are perhaps better known for their chequered black and white shirts, and also for being one of the more diverse sporting clubs in the country with teams in 16 different sports, rocked the established order and captured the Primeira Liga title. Under the inspired management of former Portuguese international Jaime Pacheco, Boavista not only conceded the least amount of goals (22) in the league over the course of the 2000-2001 season but also finished second only to Porto in goals scored (63). 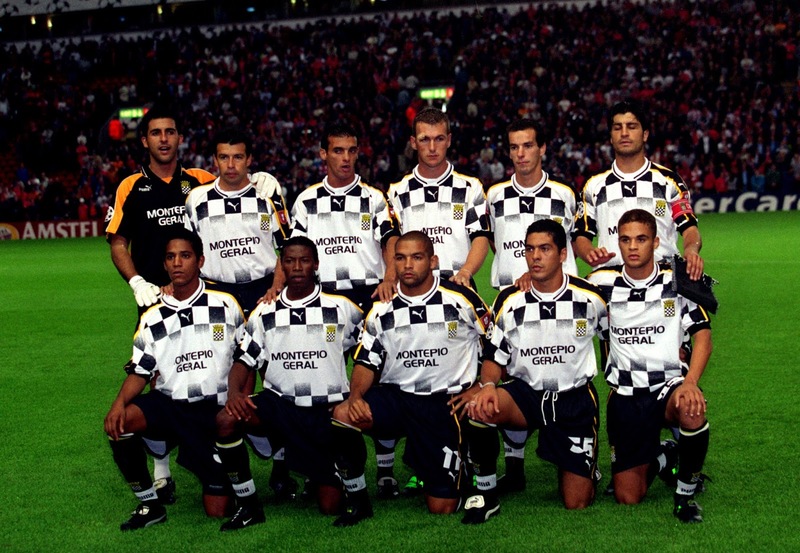 Heading into their final match of the season on 18 May 2001, against the already relegated Desportivo das Aves, a win would hand Boavista the title, but anything less would see Porto claim yet another Portuguese crown. Any nerves were calmed in the 23rd minute when Aves' defender Jose Soares put one through his own net before Brazilian striker Elpídio Silva put "As Panteras" (The Panthers) two up on 48 minutes. In the 65th minute a goal from substitute Augusto Silva Wheliton put the match beyond doubt as Boavista became the first side outside of The Big Three in 55 years to capture the title. It is interesting to note that for most of the 1940's, Belenenses were a top-4 club, but could only reach the absolute top in 1945-46. They allowed only 24 goals to be scored agains them, and their 74 goals scored was second only to 2nd place Benfica (82 goals scored). That's right Graham. Belenenses were a good side in the late 1940's and early 1950's. They finished as runners up, I believe, twice as well as winning the title in 1946. Out of the 82 times the Portuguese league has been contested, only seven times has the runner up been anyone other than one of the Big Three. Which is remarkable.